The sad fact, according to Basex, is that 62% of workers believe that it is completely okay to interrupt colleagues at work – for any reason! Here’s the trouble that you face when you don’t take active steps to reduce interruptions at work: You work longer, harder, and the quality of your work suffers. If you too experience too many interruptions in your work day, GOOD NEWS! 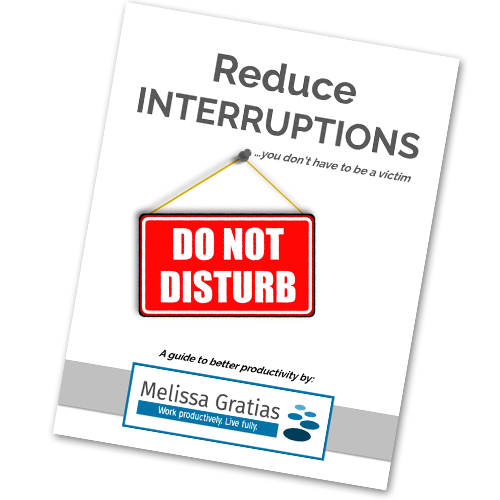 I’d like to introduce you to my eBook Reduce Interruptions…you don’t have to be a victim. 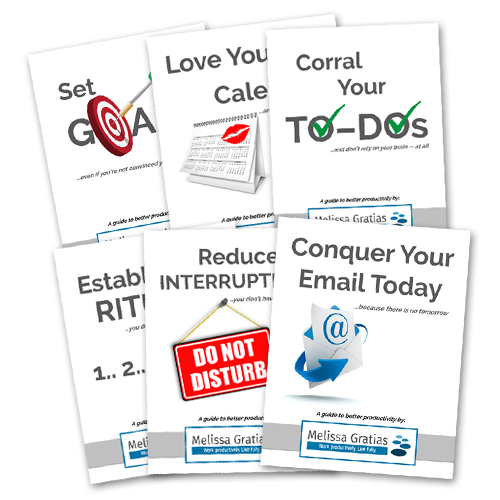 Now you can get your work done in the daylight hours when you get my eBook Reduce Interruptions…you don’t have to be a victim for only $3.99. P.S. – I’ve put my very best advice in Reduce Interruptions…you don’t have to be a victim. You will finally be able to focus and get your work done. I appreciate your approach and instruction. I do also see the psychology involved. Thanks! [Melissa] teaches better methods and processes in time management, planning, overcoming barriers, and being more successful and productive as an individual. A true Jedi of her trade. I use the concepts and teachings that Melissa gave me every day; and it makes me a better, and more efficient, productive leader.